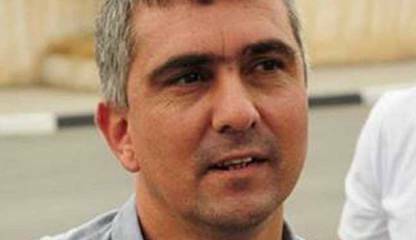 (25.02.2014) “EBCO is shocked at the provocative and outrageous imprisonment of its Board Member Murat Kanatlı, a Cypriot conscientious objector and human rights activist, and demands its immediate and unconditional release. We also call for the full recognition of the right to conscientious objection for conscripts, reservists and professional members of the armed forces, in line with European and international standards”, Friedhelm Schneider, EBCO’s President stated today, after Turkish Cypriot conscientious objector Murat Kanatlı was sentenced to 10 days in prison for his refusal on grounds of conscience to participate in the annual compulsory military exercises in the northern part of Cyprus. Murat Kanatlı, an EBCO Board member, had declared his conscientious objection in 2009, stating that his goal is for the human resources of war to dry up and that personally he will not participate in any war, so it is meaningless to participate in any preparation for war. “If there was a war in Cyprus, I would not take sides. Who are our enemies? Is it anyone who is on the other side of the barbed wire? Are our enemies the friends that we drink coffee with every day in Ledra Street?” Since then he has refused each year to participate in the annual compulsory military exercises in the northern part of Cyprus. On 14th June 2011 he was summoned to appear in the Military Court on charges relating to his refusal in 2009. 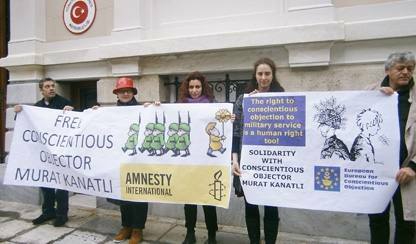 After numerous postponements, on 8 December 2011 the Military Court accepted the demand of Murat Kanatlı to refer his case to the Constitutional Court, as it refers to freedom of conscience which is a human right guaranteed by the constitution. After the decision of the Constitutional Court the trial of Murat Kanatlı continued at the Military Court which delivered its judgment today, stating that the right to conscientious objection is not regulated in domestic laws and it only took the constitutional provision on right and duty to homeland to armed service and the relevant legislation on armed services while disregarding the decisions of the European Court of Human Rights. The Court went on to state that even if it was going to give a judgement in the light of the relevant case law of ECtHR, Kanatlı was objecting to serve due to his political beliefs which the Court did not consider to constituting a conviction or belief of sufficient cogency, seriousness, cohesion and importance to attract the guarantees that are safeguarded in Article 9 of ECHR. Furthermore, the Court continued to say that as alternative service is not regulated and because of the existence of the Cyprus conflict the case would fall under the limitation because it considered the regulation to be necessary in a democratic society in the interests of public safety. The court handed down a penalty of 500 Turkish liras or 10 days imprisonment if Kanatlı failed to pay the penalty. Upon his refusal to pay the penalty Kanatlı was sent to serve 10 days in prison. EBCO would remind the authorities in the northern part of Cyprus that last September the UN Human Rights Council adopted without a vote Resolution 24/17, in which it recognises "that conscientious objection to military service derives from principles and reasons of conscience, including profound convictions, arising from religious, ethical, humanitarian or similar motives". The convictions revealed in Murat Kanatlı's declaration cannot be dismissed as merely his political opinions. EBCO would also point out that in the same resolution the Human Rights Council emphasised that "States should take the necessary measures to refrain from subjecting individuals to imprisonment solely on the basis of their conscientious objection to military service and to repeated punishment for refusing to perform military service," and recalled "that repeated punishment of conscientious objectors for refusing a renewed order to serve in the military may amount to punishment in breach of the legal principle ne bis in idem;". EBCO supports the call of the Initiative for Conscientious Objection in Cyprus for the international community to express its solidarity with Murat Kanatlı and send letters of protest to the Turkish Cypriot authorities as well as Turkish authorities’ embassies abroad which is the country directly responsible for human rights violations in the northern part of Cyprus following the Turkish invasion of the territories in 1974.